It's not unusual for couples to upgrade the wife's engagement ring after being married for a period of time. It's certainly not something that all couples would consider, but many couples do choose to upgrade eventually. There are many ways to approach an engagement ring upgrade, depending on the style of the original ring and how much of a change you wish to make. Diamond solitaires are the simplest style to upgrade. 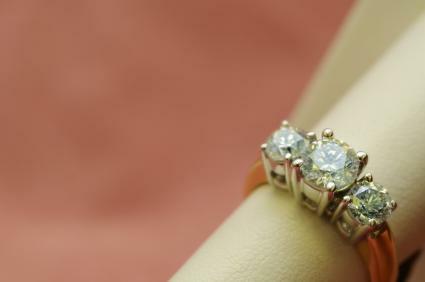 Most jewelers sell a variety of diamond ring enhancers. These are specially designed rings that literally wrap around a solitaire diamond and transform a single gem into an elaborate setting with multiple accent stones. These enhancers are available for any size or shape diamond, though you may need to shop around to find one that best fits your particular ring. If you choose this option, it's best to have the enhancer and your original ring soldered together to insure a smooth, tight fit. Diamond solitaires can also be accompanied by diamond bands or reset into more elaborate settings. 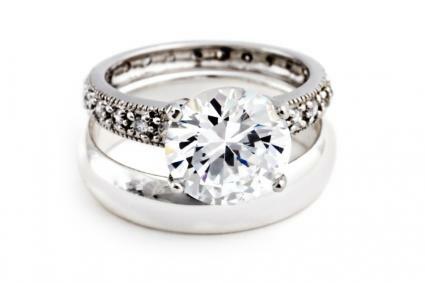 A wedding or bridal set that includes an engagement ring and a wedding band can be more difficult to upgrade. Typically, these ring sets are designed to fit snuggly together and may have elaborate edges or curves that are difficult to match to an upgrade. The easiest way to upgrade a wedding set is to add another thin band, like a channel set anniversary band or a diamond eternity band. Try on several variations before making a selection to ensure that the set does not look overshadowed or unbalanced by the new ring. Heirloom engagement rings can be difficult to upgrade because they often have unusual shapes. Many of them are antiques, which means the metal is more fragile to work with when adding enhancements. The easiest way to upgrade an heirloom ring is to reset the original stones into an entirely new ring with the setting and design of the bride's choice. This allows personalization and customization while still incorporating family tradition and sentimentality into the piece. For some couples, the best option is to upgrade to a new engagement ring altogether due to a change in style preference or damage to the original ring. Additional sentimental significance can be added when upgrading to an entirely new ring. Children's birthstones can be added to the new design, or specialized filigree metalwork can be incorporated to add words or numbers to the band itself, such as the wedding date or couple's initials. 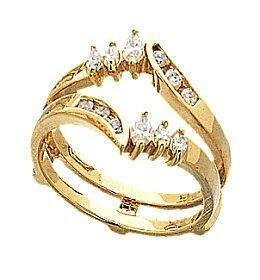 Three stone rings are popular choices for their natural symbolism of the couple's past, present, and future. You may choose to upgrade your ring for a variety of reasons. Perhaps your original engagement ring was a family heirloom that simply doesn't suit your style, or you couldn't initially afford the type of ring you really wanted. Your preferences for diamond size, shape, or cut may have changed, or your ring may have become damaged. Regardless of the reason for upgrading your engagement ring, it is important to shop as carefully for a new ring as you did for the original. You may need to refresh your memory about how to judge diamond quality and how to interpret the four Cs. You may also want to investigate new or unusual types of engagement rings, such as pave settings or Asscher cut diamonds to expand your options for different styles. Many couples choose to upgrade an engagement ring for a significant wedding anniversary or other special occasion, such as the birth of a child. 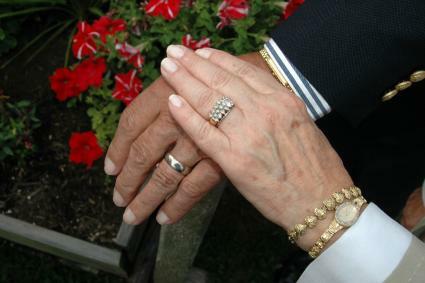 Couples sometimes decide to upgrade before renewing their wedding vows, or to mark the celebration of a major anniversary milestone, such as their tenth, twentieth, or twenty-fifth wedding anniversary. The decision is sometimes made to celebrate a change in financial status, such as a major promotion of one of the partners or in celebration of paying off a mortgage. Of course, you can make a change any time you like and for any reason that seems appropriate to you and your spouse. Make the decision to upgrade together to be sure that both spouses are pleased with the decision. If you buy a new ring, take care to preserve your original engagement ring for yourselves and, possibly, for future generations. Careful consideration of the original ring's style paired with savvy shopping and attention to the woman's preferences guarantees the new engagement ring is valued as the original was, and in the spirit of love and commitment that pervades the relationship, both rings will continue to symbolize the couple's life together.